than the price of search engine optimization. Search engine optimization or search engine marketing is the process of promoting a business online to achieve top search engine rankings for relevant, targeted keyphrases. Search engine optimization refers to modifying a website for search engines in order to bring searchers and suppliers together. Search engine optimization will increase qualified traffic, generate enquiries and convert more sales. Are You Taking Full Advantage Of Your Web Site? With research confirming that 70-80% of prospective web customers use search engines or search directories to find relevant content, search engine optimization is the most widely used method of attracting visitors to a website. Our search engine optimization services typically generate increased traffic from 100 percent to 17,000 percent, in some cases, in new targeted traffic. Your return on investment is almost immediate. Be viewed as the #1 industry leader in the eyes of potential clients. Did you know that 66% of all searchers believe that sites with the highest search listings are the top companies in their field? Enjoy the lowest cost-per-lead compared to every other advertising tool on the market. A 2003 study showed that Search Engine Marketing had a lower customer acquisition cost than any other form of marketing including email, Yellow Pages, banner ads, and direct mail. Less expense mean higher profit margins. Generate the most relevant and qualified leads for your company. Alpha Web Solutions' organic methodology allows customers to naturally find what they are searching for- your services. Every time a potential client searches the Internet for the service you provide, your top 5 ranking will make you an instant prospect in the customer’s consideration set. Make your way to the top, and STAY there. SEO is the ultimate marketing tool because once you reach the top, it costs very little to maintain your position. You can enjoy an “industry leader” status forever! 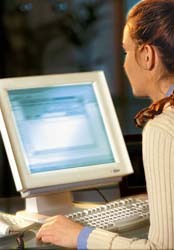 Search engine results pages (SERPS) accurately show the performance of a web site in search engines. Search engine optimization improves results and placement thus increasing traffic and the number of potential customers. 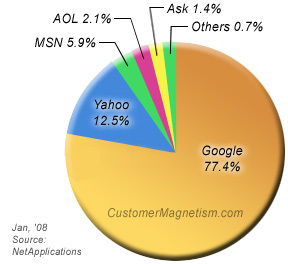 Yahoo and Google together hold almost 90% of the search engines market share, that's millions of searches per day. Because things change very quickly in the search engine optimization industry we constantly monitor developments and the latest changes within the search engine world. It's impossible for any SEO firm to guarantee specific search engine placement results, but through extensive study of search engine optimization trends and practice of ethical SEO, we can greatly increase the chances of excellent placements in major search engines, usually with top 10-20 results. By the end of the three-month period, you can usually expect to see your site ranked in the top 10-20 on most of the keyword phrases which we specifically optimized for, in most of the major search engines. Keyword research: We Perform extensive keyword research to determine your targeted keyword phrase that will fetch you greater ranking and visibility in all the major search engines and directories. Meta tag optimization: Optimizing titles, H1, H2 tags and other parts of the code as necessary. W3C html validation: HTML verification and validation to make sure your website is search engine friendly. Search Engine Submissions: Submitting optimized page URLs to the major search engines. Link structure analysis: We perform an initial link analysis to see what improvement can be made to your site. Unlimited consultations: We strive to involve the client as much as they desire. Through Consultation and explanation our client becomes an educated client. Monthly ranking reports: Monthly search engine ranking reports and summaries. Getting improved search engine placement doesn't "just happen", it takes work, it takes patience and it takes time. But it doesn't have to take thousands of dollars. We can help bring traffic to your website. Proper Search Engine Placement And Optimization is the first and most important step in promoting your website.